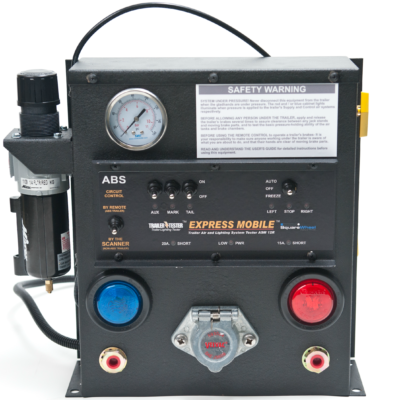 Our Express Garage is a Remote Control Light & Air Brake Trailer Tester System that really works! 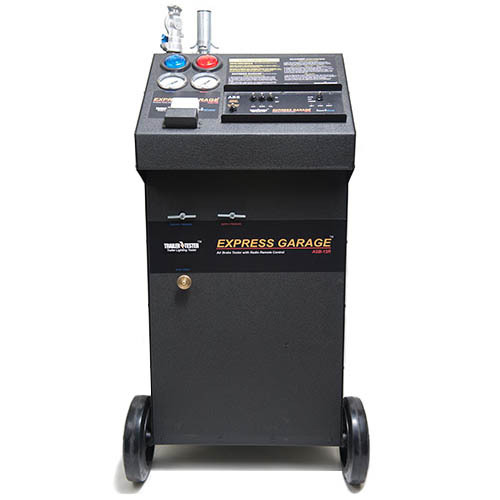 The Express Garage is a Remote Control Light and Air Brake Tester System designed with three objectives: make it versatile, make it easy to use, and make it sturdy. So we designed a tool that anyone with even basic air brake knowledge can look at and instantly know how to use. Radio remote control light and air brake tester. Each unit comes with two remotes. Adjustable air pressures for both Supply and Control circuits. Built in air check value to allow for easy leak-down testing. Tests all lighting and air functions in minutes. Needs only a shop air hook-up to use. 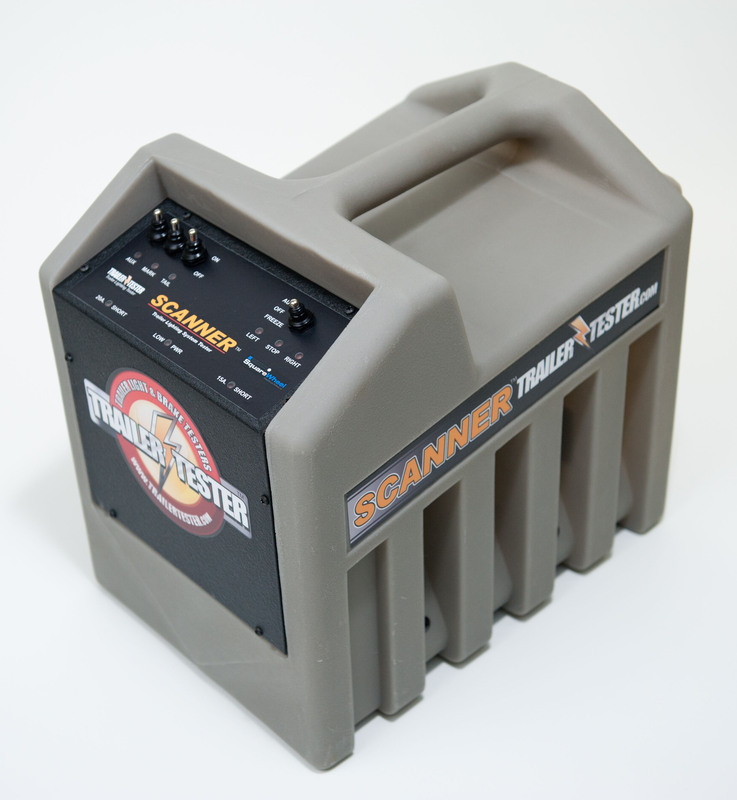 Weight (less battery) 105 lbs (47.7 kg); add approx 30 lbs (13.6kg) for your battery. Cabinet 16 Gauge Steel / Base pan 14 gauge. Weldment forms structure. Gloss black finish. Mobility 28” solid rubber tired wheels w/roller bearing hubs & grease fittings. 24 1/2” swivel casters. Pull handle on caster end of cabinet. Scanned Circuits Left – 1.5 sec. – Stop – 3.0 sec. – Right – 1.5 sec. Circuits powered 1 at a time & cycle repeats indefinitely. Freeze feature stops scanning action if desired. Circuit Breakers Aux/Mark/Tail – 20 amps total. SAE type 1 auto reset. Left/ Stop/Right – 14.6 amps each. SAE type 1 auto reset. Low Battery Warning One LED. Blinks at 11 volts. Full on at 10 volts & scanning halted. Air Regulation Supply – variable regulator (2-125 PSI) controls supply pressure & feeds control pressure regulator. Control – variable regulator (2-125 PSI) allows additional pressure reduction as needed. Apply Speed Control Control side; infinitely adjustable flow valve controls speed of service brake. Air Pressure Gauges Twin 2 1/2” pressure gauges indicate pressure; available or applied. Air Pressure Lights 2 large pressure lights each for Supply/Control. 1 red light for Supply& 1 blue light for Control; located on control panel& 1 red light and 1 blue located in rear of cabinet for view of someone under trailer. Air Actuation 2 channel radio remote operates Supply & Control air independently. 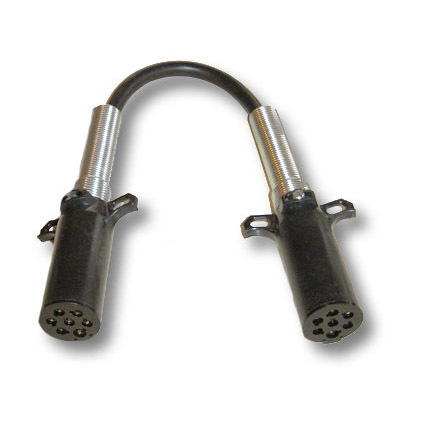 Air Hoses/Gladhands 3/8” air brake hose w/color coded gladhands for supply & control can reach gladhands up to 7’3” (2.21m) from shop floor. Channels 2 FM channels operate Supply air & Control air. W/ ABS panel switch flipped to “W/Remote”. Remote also controls Auxiliary & Stop electrical circuits in conjunction w/air solenoids.